BOSTON--(BUSINESS WIRE)-- The United States nudged up one spot to No. 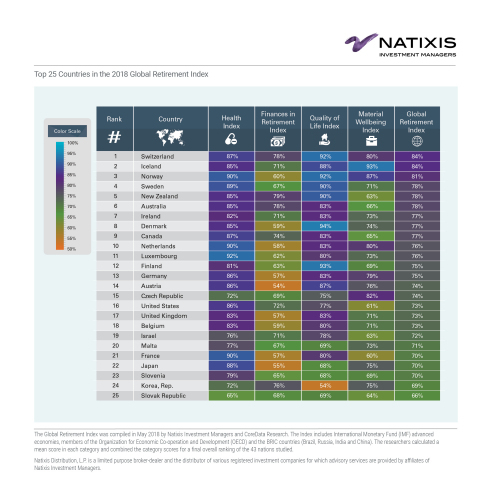 16 among 43 countries in the 2018 Global Retirement Index, released today by Natixis Investment Managers. The modest rise in the US ranking is attributed to improving economic conditions and financial institutional strength. However, 10 years after the global financial crisis, Natixis points to a confluence of factors – ultra-low interest rates, growing levels of public debt, aging populations and human longevity – as indicators for the ongoing sustainability of retirement systems in the US and around the world. Now in its sixth year, the Global Retirement Index provides a snapshot of 43 countries and their relative score on key measures that influence retirement security. An overall score for each country is based on an examination of 18 factors across four broad categories: Finances in Retirement, Material Wellbeing, Quality of Life and Health. Western Europe continues to dominate the top 10 countries in the 2018 index, including Switzerland (No. 1), Iceland (No. 2), Norway (No. 3), Sweden (No. 4), Denmark (No. 8) and the Netherlands (No. 10). New Zealand (No. 5) and Australia (No. 6) maintain their positions in the top 10. Ireland enters the top 10 for the first time, climbing from 14th last year to 7th which is the largest jump in both rankings and score of all countries. Ireland’s ability to cut its unemployment rate to 6.2% as of 2017, and subsequently reduce income inequality, contributed to its rise in the index. It also boasts a significant improvement in tax pressure, and thus an increase in the level of disposable income of retirees. Canada returned to the top 10 (No. 9) mainly as a result of improvements in the biodiversity, air quality and environmental factors indicators within the Quality of Life sub-index. It has the second-highest air quality and seventh-highest personal happiness scores in the entire Index. In the Material Wellbeing category, Canada’s unemployment indicator improved as the country benefited from a stronger jobs market in 2017. The Natixis report, “Protecting the Promise: Five critical threats to global retirement security,” provides a backdrop for the 2018 Index. According to the analysis, which examines retirement challenges through a post-crisis lens, the unintended consequences of monetary policy moves playing out over the past decade have put retirement security further from reach, making savings more expensive, stifling employment and wage growth, and all but eliminating the yield retirees were counting on from bond staples. The prolonged period of suppressed interest rates left both pensioners and pension managers in the lurch. Retirees have had to moderate income expectations in line with low interest rates or take on significantly higher levels of risk with their retirement savings just to stay even. The US, like virtually every other developed country, is now facing the challenges of a growing old-age dependency ratio and a widening gap in economic opportunity between the “haves” and “have nots.” Rising healthcare costs present yet another quality-of-life challenge to retirement security. More jobs, but unbalanced economic opportunity persists: Improvements in the job market helped the US advance its score for the Material Wellbeing category. It also registered a slight improvement in the income equality gap compared to last year, but the US still has the seventh-worst score for this indicator, despite having the fifth-highest income per capita of all countries in the index. The results imply an ongoing challenge that lower-income Americans may be struggling to save for retirement. Environmental risks: The US improved its performance for air quality and for environmental factors, but the latter indicator could use improvement, with the seventh-lowest score among all countries. It lagged last year’s score for protection of its ecosystem (e.g. flood control and soil renewal), and its happiness indicator score, which evaluates the quality of retirees’ current lives, also declined. Health expenditures and ROI: The US maintained its position in the top 10 for the health category, in part because it spends more per capita on healthcare than any other country in the index, but the US dropped to No. 10 from No. 7 due to further decline in its life expectancy score, suggesting its health expenditures may not be yielding the same return on investment. To download a copy of the Global Retirement Index, visit im.natixis.com/us/research/2018-global-retirement-index. The Global Retirement Index assesses factors that drive retirement security across 43 countries where retirement is a pressing social and economic issue. It was compiled by Natixis Investment Managers with support from CoreData Research. The index includes International Monetary Fund (IMF) advanced economies, members of the Organization for Economic Co-operation and Development (OECD), and the BRIC countries (Brazil, Russia, India and China). The report captured data from a variety of sources, including the World Bank. The researchers calculated a mean score in each category and combined the category scores for a final overall ranking of the 43 nations studied. As part of the Natixis Investment Institute, the Center for Investor Insight is dedicated to the analysis and reporting of issues and trends important to investors, financial professionals, money managers, employers, governments and policymakers globally. The Center and its team of independent and affiliated researchers track major developments across the markets, economy, and investing spectrum to understand the attitudes and perceptions influencing the decisions of individual investors, financial professionals, and institutional decision makers. The Center’s annual research program began in 2010, and now offers insights into the perceptions and motivations of over 59,000 investors from 31 countries around the globe. Natixis Investment Managers serves financial professionals with more insightful ways to construct portfolios. Powered by the expertise of 27 specialized investment managers globally, we apply Active ThinkingSM to deliver proactive solutions that help clients pursue better outcomes in all markets. Natixis ranks among the world’s largest asset management firms2 ($988.4B / €846.5 billion AUM3). Headquartered in Paris and Boston, Natixis Investment Managers is a subsidiary of Natixis. Listed on the Paris Stock Exchange, Natixis is a subsidiary of BPCE, the second-largest banking group in France. Natixis Investment Managers’ affiliated investment management firms and distribution and service groups include Active Index Advisors®;4 AEW; AlphaSimplex Group; Axeltis; Darius Capital Partners; DNCA Investments;5 Dorval Asset Management;6 Gateway Investment Advisers; H2O Asset Management;6 Harris Associates; Investors Mutual Limited; Loomis, Sayles & Company; Managed Portfolio Advisors®;4 McDonnell Investment Management; Mirova;7 MV Credit; Ossiam; Ostrum Asset Management; Seeyond;7 Vaughan Nelson Investment Management; Vega Investment Managers; and Natixis Private Equity Division, which includes Seventure Partners, Naxicap Partners, Alliance Entreprendre, Euro Private Equity, Caspian Private Equity;8 and Eagle Asia Partners. Not all offerings available in all jurisdictions. For additional information, please visit the company’s website at im.natixis.com | LinkedIn: linkedin.com/company/natixis-investment-managers. Natixis Investment Managers includes all of the investment management and distribution entities affiliated with Natixis Distribution, L.P. and Natixis Investment Managers S.A.
2 Cerulli Quantitative Update: Global Markets 2018 ranked Natixis Investment Managers as the 16th largest asset manager in the world based on assets under management as of December 31, 2017. 3 Net asset value as of June 30, 2018. Assets under management (“AUM”), as reported, may include notional assets, assets serviced, gross assets and other types of non-regulatory AUM. 4 A division of Natixis Advisors, L.P.
5 A brand of DNCA Finance. 6 A subsidiary of Ostrum Asset Management. 7 Operated in the U.S. through Ostrum Asset Management U.S., LLC. 8 Caspian Private Equity is a joint venture between Natixis Investment Managers, L.P. and Caspian Management Holdings, LLC.